Thanks to Ben Thomas @BiinT for reminding me of the Competitive Collaboration that is already taking place in Sydney with the Better Building Partnership. A collaboration of the some of the largest commercial property owners in Sydney. 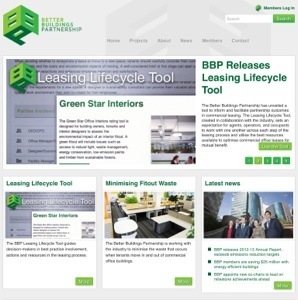 The Better Building Partnership was was launched in the UK December 2007 with participation from British Land, Grosvenor, Hammerson, Hermes Real Estate, Land Securities, Transport for London and the Mayor of London, and has since been joined by Blackstone Group, Canary Wharf Group, GE Capital Real Estate, Henderson Global Investors, Legal & General Property, PRUPIM, Quintain, Workspace Group, The Cadogan Estate and LaSalle Investment Management. In Sydney the “Better Buildings Partnership was launched by the Lord Mayor of Sydney, Clover Moore MP on the 30 June 2011 along with founding members; AMP Capital Investors, Brookfield Office Properties Australia, Charter Hall, City of Sydney, Colonial First State Global Asset Management, DEXUS Property Group, Frasers Property, The GPT Group, Investa Property Group, Lend Lease, Mirvac, Stockland, the University of Sydney, and the University of Technology. There have already been some great examples of collaboration with many more underway. As for the sharing of our precious resources amongst the BBP members, well – “watch this space”.